Chittorgarh located a 110km to the north of Udaipur has a long history and it has been fought over since the eighth Century.From the eighth to the 16th Century it was the seat of power of the Mewar Kingdom. The Mewar Kingdom stretched from Gujarat to Ajmer. During these 8 centuries The Fort of Chittor was overrun and sacked three times. Today an immense stretch of walls and ruined palaces still remain as a reminder of the battles won and lost here. Perhaps the most romantic story relates to Padmini the famous Queen of Chittor in 1303. When the Sultan of Delhi Alauddin heard of her beauty he decided to wage war with Rana Ratan Singh the King of Chittor. It is thought that the king agreed to a compromise which allowed the Sultan to have a glimpse of Padmini by means of a mirrored reflection. War was not avoided however and the Sultan attacked and Padmini and her entire entourage of women committed jauhar. The men continued to fight to the death. Today the Fort of Chittor still stands on its 180 meter high hill. It is regarded as one of the most outstanding forts in Rajasthan. The fort is approached through seven huge gateways which are guarded by a watch tower and massive iron spiked doors. The remains of the palace are known to have underground cellars where it is believed the women committed Jauhar. Monuments of note here are the victory tower and the Padmini Palace. The Gaumukh reservoir is a deep tank that is filled by a spring situated at the edge of a cliff. The spring is considered to be sacred. There are also temples that may be visited here. The Meera Temple is of particular beauty as this temple dedicated to Lord Vishnu has beautiful idols in its inner sanctum. There is also a small temple nearby that is dedicated to Lord Krishna. 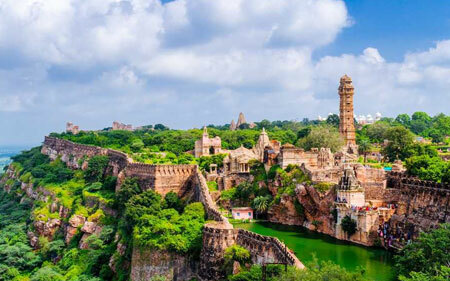 The mighty fort of Chittorgarh with its impressive views is definitely a must see.The town known for its massive fort on top of a hill can be singled out for its glorious and fascinating past. The fort has a chequered history, it has witnessed some of the bloodiest battles in history, three great sakas and some of the most heroic deeds of valour, which are still sung by the local musicians.